NFL Predictions: Brett Favre Returns to Vikings for 2010: On various sports betting sites, one can wager on the predicted number of regular season NFL predictions wins of every NFL team. Over or Under. These prospective victories can be used to help forecast the NFL Predictions Division Winners and playoff teams. Conclusively, aiding bettors on their 2011 Super Bowl Predictions winner. One predominant person seems to be slowing down the entire process. It's kind of like waiting for two of your teammates to arrive for your B League softball game that was supposed to start five minutes ago. They don't show up and you have to forfeit the game. The person were waiting on, in this case is Brett Favre. There are NFL Predictions on the Minnesota Vikings to win the NFC (7-1), as well as odds to win the Super Bowl (14-1). I havn't seen any odds or NFL Predictions for the number of games the Vikings will win, nor any odds for ANY of the NFC North's teams to win their division. Currently, wagers can be made for the winners of all of the other divisions. These omissions are a direct effect on whether Brett Favre decides to play the NFL Predictions season or not. Some may argue that this makes it more exciting, I suspect professional gamblers don't. The "Favre Effect" reverberates throughout both leagues as the Vikings and the rest of the NFC North's division teams have to play each of the AFC East teams, New England, Miami, The Jets, and the Bills. One victory or loss could determine the playoff fate of at least three out of four of the teams in that division. The Vikings, (sans Favre) beat the St. Louis Rams in their first NFL preseason game. Sage Rosenfels, the Viking's current 3rd string QB (including Favre) had a good performance, and Minnesota's defense, which was ranked 2nd against the run last year, held the Rams to 33 yards on the ground. this is good news for Viking fans. We'll have to see if this continues against better teams. 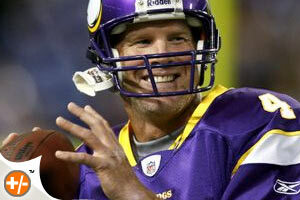 Reports are coming in now that Brett Favre will indeed return to the Minnesota Vikings lineup for another season. Alright Brett! Now we can make our 2010 NFL predictions. Who is on the Vikings? You can make your Brett Favre bets at Sportsbook.com, from how many TD's to total yards, it's time to make your 2010 NFL predictions on Brett Favre.